In Italian, cacio e pepe mean cheese and black pepper. This term also stands for a type of pasta from Roman cuisine. 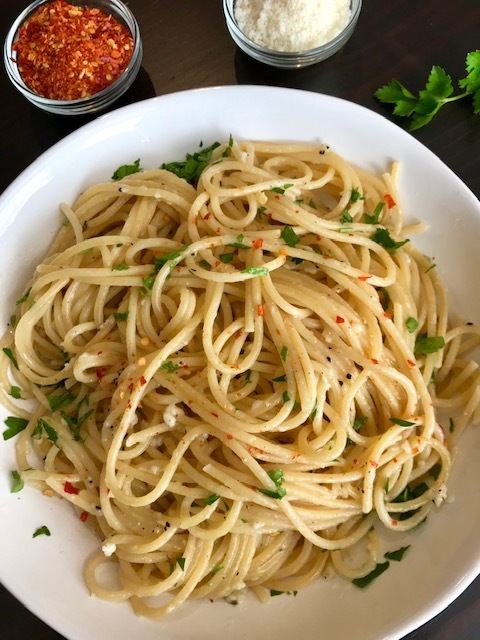 Spaghetti cacio e pepe is made by Italians all over Italy because it is made quickly and with few ingredients. Personally, I enjoy this dish at home because it tastes better than in most restaurants and it’s a lot cheaper. Try making this yourself – you’ll love it! 1. Bring a 6 to 8-quart pot of water to a boil. 2. Add spaghetti and cook for 10 minutes, or until it is al dente (crunchy-tender). 3. When spaghetti has cooked about 6 minutes, heat the oil in a 12-inch skillet. DO NOT LET IT SMOKE. 4. When oil is hot, stir in the garlic and black pepper and fry until the garlic is barely tender – DO NOT LET IT BROWN. 5. Transfer the skillet with garlic-pepper mixture to a cold burner. 6. Meanwhile, reserve about 3/4 cup boiling liquid from spaghetti. 7. Heat the garlic pepper mixture in skillet and drain the spaghetti. 8. Immediately add drained spaghetti to skillet and toss over high heat. 9. Stir in some of the boiling liquid – it should thicken the spaghetti mixture. 10. Immediately stir in the cheese and toss spaghetti until it is evenly-coated. 11. Serve in individual bowls and garnish with minced parsley. Ask guests to add red pepper flakes, if desired. Wine Pairing: Chilled Fiano di Avellino (Italian white wine), Chardonnay or Pinot Grigio.